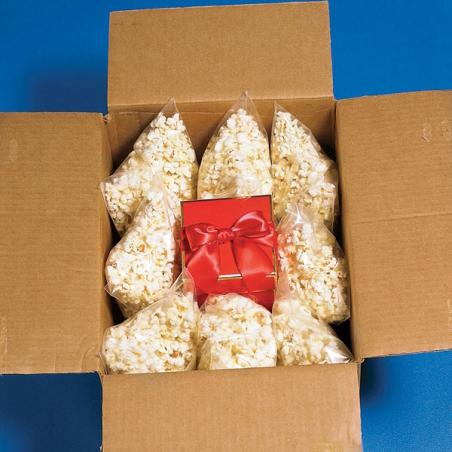 The next time you need to send a gift, instead of using toxic polystyrene padding, add some packed popcorn bags. They will ensure the gift stays safe and secure. Don't get frustrated when you can't find the end of the tape. If you pop a paperclip on the end it will always be easy to find. 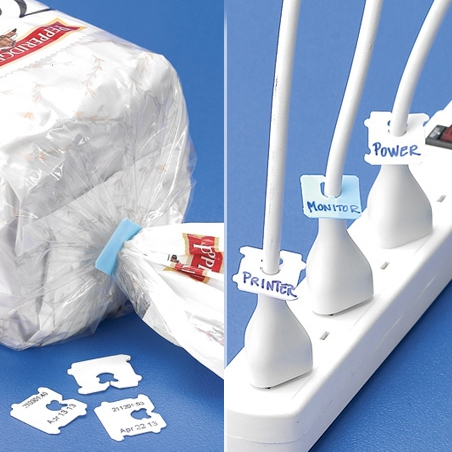 Make it easy to identify power cords by re-using the fasten tabs on loaves of bread. Use a permanent marker to show which plug goes where and you won't have to worry about unplugging the wrong thing. This is also a great idea for behind the TV or media centre. 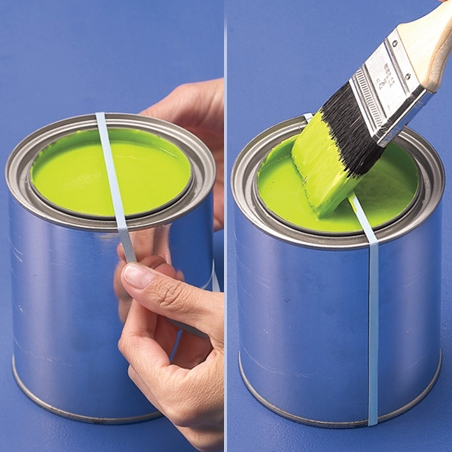 A rubber band placed over a can of paint will prevent drips and runs when using paint directly from the can. 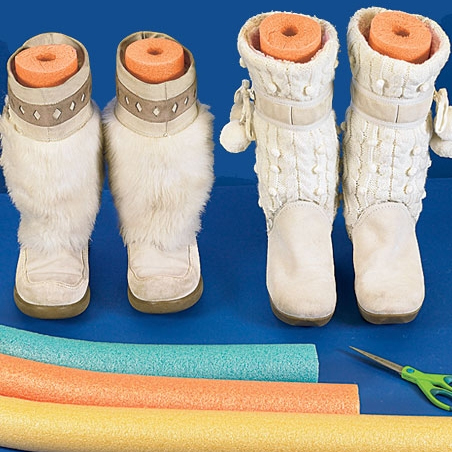 Don't let your boots get scrunched up at the bottom of the closet - pop in a piece of pool noodle - a poodle - and they will keep their shape and be ready for use. 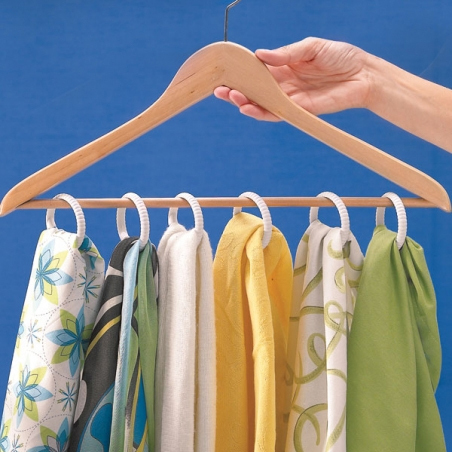 Use shower curtain rings to store your scarves on a coat hanger to make them easier to store and easier to find. Click here to make your own scarf rack. 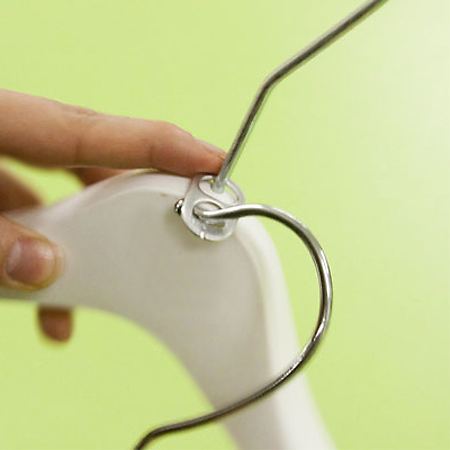 Double up your hanging space in a closet by using can tabs to hang two coat hangers together. 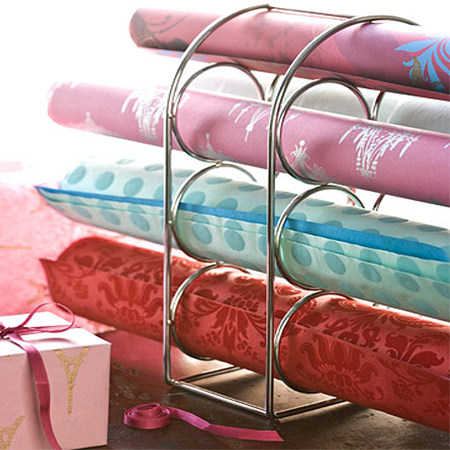 Store wrapping paper in a wine rack. It keeps the papers tidy and prevents them from wrinkling or bending. 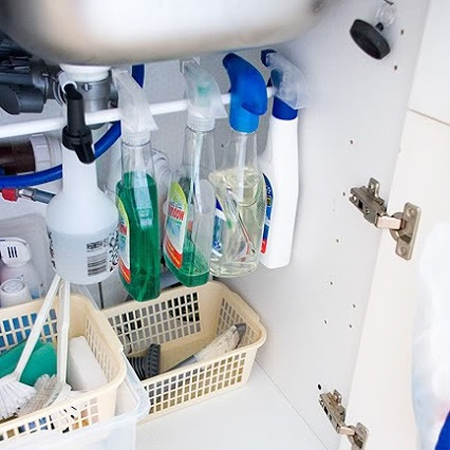 There never seems to be enough space under a sink for all your cleaning stuff and this pretty clever idea is a great way to solve the problem. Simply install a tension rod (it has a tighten/loosen screw at both ends) so that you can hang your cleaning supplies. Repurpose old drawers into underbed storage by adding some casters to the base of each drawer. You can use these to store away items not frequently used. 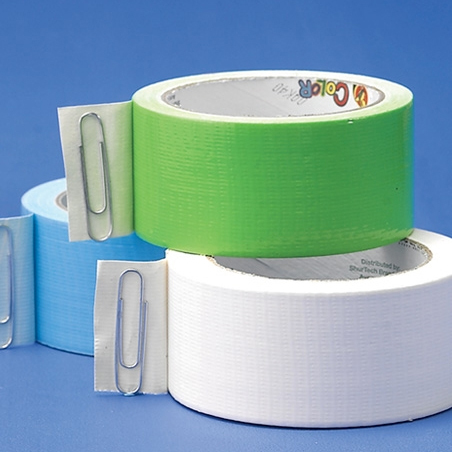 To protect from dust, add a velcro strip around a piece of fabric and glue the other side to the top edge of the drawer. 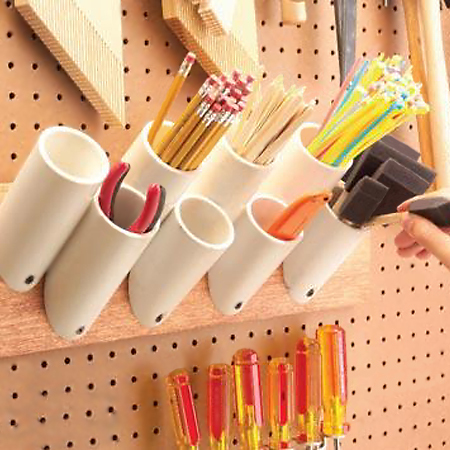 Use offcuts of PVC plumbing pipe in your workshop or craft room to store and organise your supplies and tools. Use a hacksaw or jigsaw to cut pipes at an angle and then mount these onto a piece of board - with screws driven in at an angle - to hang onto the wall. 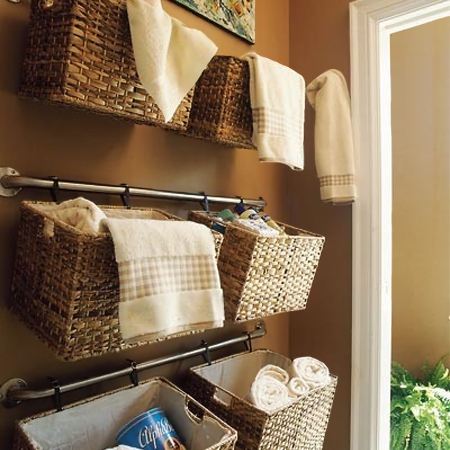 Mount towel rails onto the wall and use hooks to hang storage baskets. Three standard length towel rails will allow you to hang six baskets that can be used for storage in a bathroom, laundry or child's bedroom. Click here for tips on how to drill holes into brick walls. 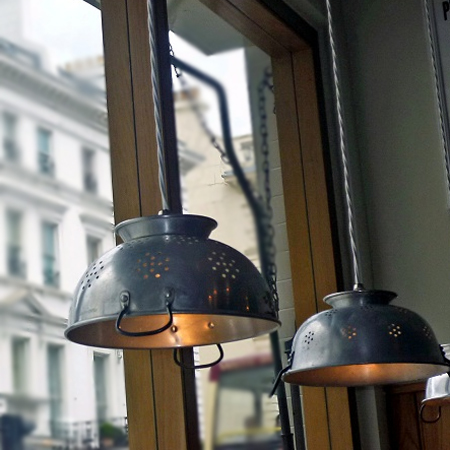 Use a kitchen colander to create unique pendant lights for a kitchen or outdoors on a patio. When switched on they give off wonderful patterns and add atmosphere. Use a drill and hole saw to drill out a hole in the base of the colander that is the right size to fit the lamp fitting through. 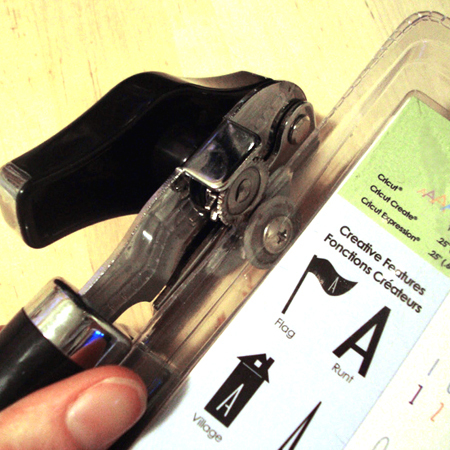 Don't battle with hard plastic containers - use a tin opener to quickly cut around the edge and make them easier to open.